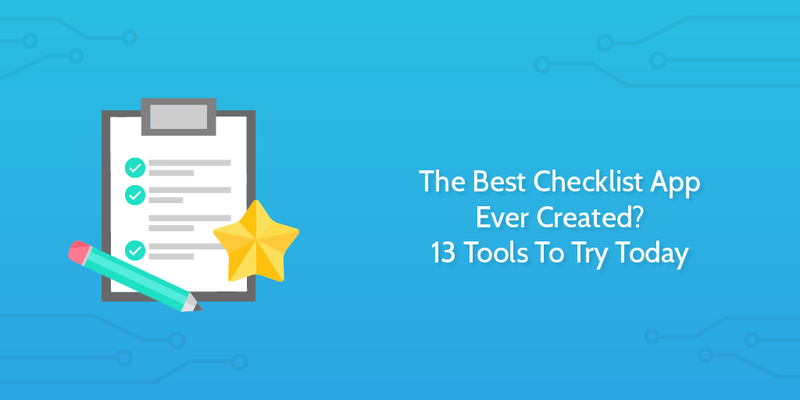 Finding the best checklist app isn’t easy. I’ve written about my pains with productivity before, and I’m not the only one who has trouble sorting themselves out — you probably don’t know which productivity solution is best for you either. Part of the problem is that there are so many different apps for slightly different purposes, it’s hard to know which to choose. For this post, I’ve gone in search for the best checklist app ever created, and found some pretty under-the-radar stuff as well as apps most people already know. Let’s take a look. Here I go over 13 apps so you can get a feel for what you want to try and create a checklist, but you should also check out the bonus material here: a full comparison of Any.Do, Wunderlist and Todoist. I go deep into the details of those apps, and compare which is the best to-do list overall. Clear is the simplest app on this list. It’s got just 2 levels of navigation: lists and items. Lists contain items that change color depending on their position. The higher the item up the list, the darker it gets. With Clear, you prioritize your tasks by color and get a quick visual overview of what needs doing right now, and what isn’t so urgent. Like Trello, Google Keep is your classic wall full of sticky notes. Naturally, being a Google product, a hell of a lot of thought has gone into the search feature. Color-coding notes isn’t just for aesthetics, you can filter you notes by color, so if you wanted to keep one set of notes for your blog, another for your shopping list and red for urgent notes, that’d be the way to do it. Not to mention my single favorite thing about Keep: it integrates with Inbox by Gmail! Inbox (which I herald as the best email app ever) has a feature called ‘Reminders’. When you pin an email so you can refer back to it with ease, you also get to add a little note to it. With Google Keep, you can add your notes directly into that section of your inbox. It’s definitely not an email productivity best practice to keep your inbox as a to-do list, but I think it’s handy as a quick-fire reminder you’re bound to see when you check your emails. I love how you can set recurring tasks on Any.Do, Wunderlist and Todoist, but there isn’t a way to trigger entire checklists on demand or to a schedule. It’s just not what the apps were made to do. Then, you can set it to trigger every day at 7am and alert you. By working through the steps you can systemize and document your day, then get an overview of how you did in the week just by looking at the checklist cards on your dashboard. That’s just one way to use Process Street. There are million of use-cases, both personal and professional, including client onboarding, employee onboarding, finding anyone’s email, and even creating a process. Process Street integrates with over 500 apps through Zapier, so if you want to trigger a checklist from Trello, by email or add a task when you check off a box, that’s all really easy to set up. Also, it’s free forever, so sign up for your account here. 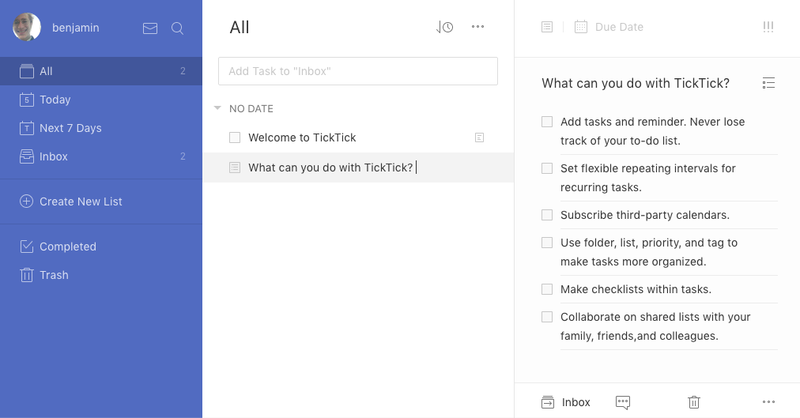 Like Todoist and Wunderlist, TickTick works with a main task Inbox and then generates several smart lists based on due date. For example, if you type ‘get dressed today’ as a new task in Inbox, TickTick will automatically sort it into the ‘Today’ list and set a due date for you. No more flicking through a tiny, horrid calendar looking for the right date — TickTick understands natural date/time language. 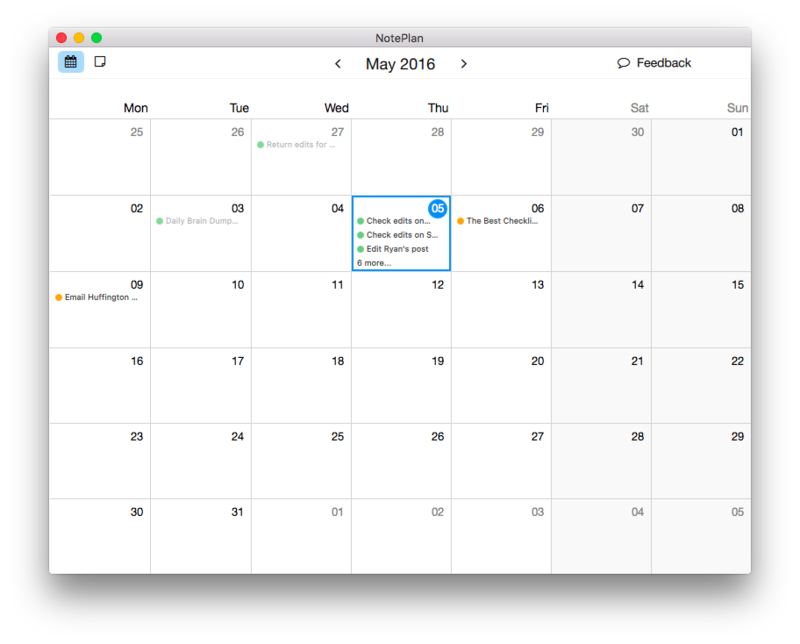 While TickTick doesn’t have integrations with many apps, it can sync from your calendar. If you like hacky integrations, you could probably wrangle that somehow. TickTick is available on Android, iOS, desktop, and everywhere else under the sun. NotePlan is part of what inspired me to write this article. Right now, it’s in beta and the creator emailed me last week with a copy. The basis of NotePlan is markdown notes/checklists attached to a calendar. So, for every day you can add notes and to-do list items and they stay connected to the calendar date. That way, you can see what you did yesterday, what needs doing today and any future plans at a glance from the main view. I’ve only been using NotePlan for a few days, but keeping my notes and checklist items away from the rest of my noise helps me focus down, and I’ve had an extremely productive time using it. 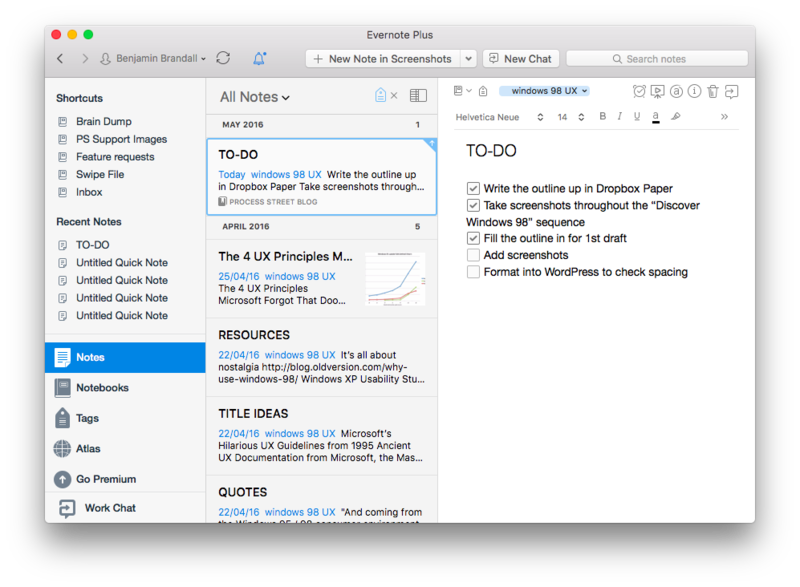 Right now, NotePlan is in beta and only available for Mac. 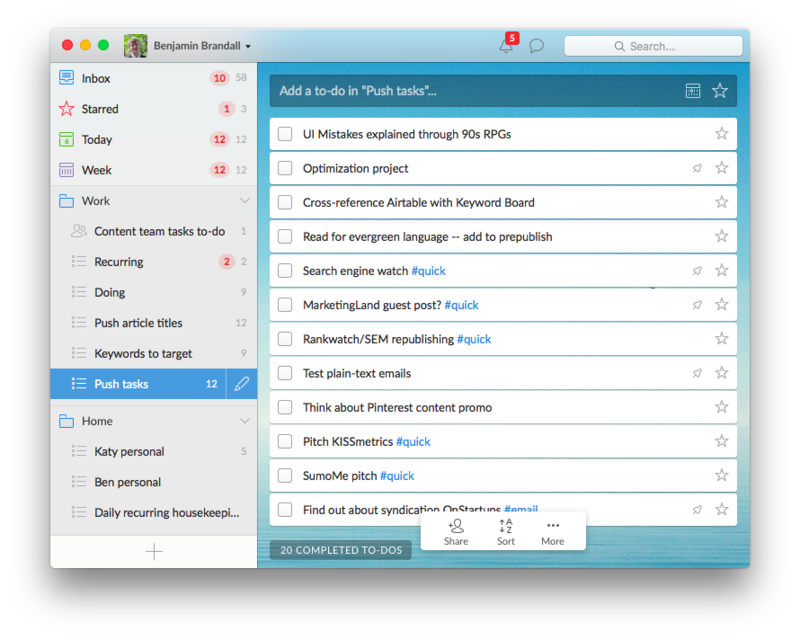 Any.Do wasn’t the right task management app for me, but it might be good for you. Essentially, it only does one thing differently, but it does that one thing extremely well. 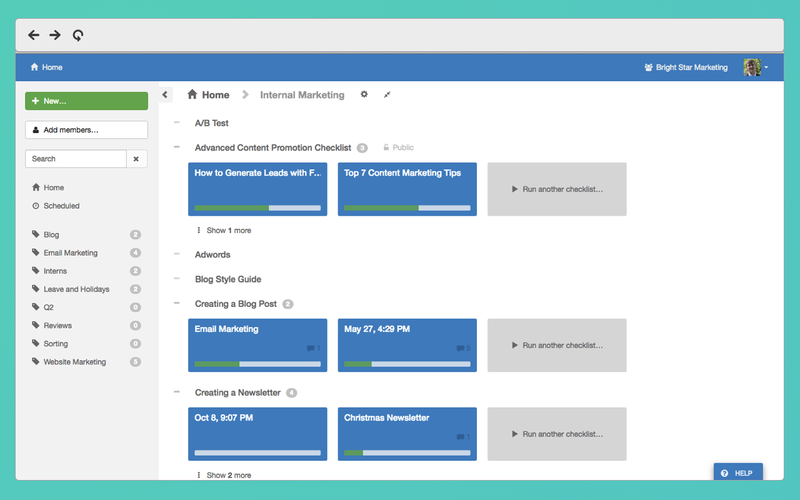 Its main selling point is a daily overview of your tasks where you can quickly assign due dates without scrolling around a calendar. By going into Moments mode every morning before you start the day, you can see everything you haven’t done yet and decide if you want to set the due date for today, tomorrow, next week or someday in the future. The major issue for me is that it doesn’t integrate with any other apps. For now, it’s totally closed off. That means that if you use anything else with your team to manage tasks, like Trello or Evernote, you’re going to have to copy over every action item instead of getting them put automatically in your list. The downsides of that senseless data-entry busywork definitely outweighed the Moments view (which I’ve since replaced with swiping right on the Todoist mobile app). To see a full overview of Any.do vs Wunderlist vs Todoist, check this out. Evernote is a task-management behemoth. However, as I’ve already looked at in my comparison of Evernote and OneNote, it has a tendency to get full of garbage extremely quickly if you’re not careful. On the other hand, if you consistently organize and tag your notes it can make for an incredibly versatile checklist app that lets you create checklists with files, images, snippet, links, and anything you might need to reference as you work through your list. Evernote isn’t strictly a checklist app, but the reason why you might want to use it as one is so you can keep everything in one place. It’s a pet peeve of mine when information isn’t centralized, so as soon as I have to start flicking between apps to make sense of my tasks, that app goes out the window. With Evernote, you can make checklists inside your project notebooks. So, if you’re writing a blog post, you’d collect all your research material, outlines and drafts in a notebook then have one more note as a dedicated checklist to refer back to. I use WorkFlowy for meeting notes, interview notes, article structures and more. Check out my full guide to taking better notes, and a breakdown of my blogging process using WorkFlowy. Wunderlist is one of the most popular to-do list apps in the world. It’s available on mobile and desktop, and lets you create and filter items into separate projects. While the mobile app is a little awkward because it doesn’t make any use of gestures like Todoist, it’s a passable experience bearing in mind it is simultaneously a) useful and b) a Microsoft product. On top of that, one of the main attractions is that you can connect it to over 500 apps using Zapier. You can do super-productive things with that, like send to-do items from all over the web, notify others automatically when you check tasks off, etc. For an in-depth comparison of Wunderlist vs Todoist vs Any.Do, click here. If you can’t be bothered with yet another bloated checklist app and want something that works intuitively and simply, Checklist+ is the app for you. It doesn’t have tags, filters, searches, labels, or 10,000 bells and whistles that serve mainly as UI clutter. It’s optimized for pure ease-of-use and its features boil down to ‘lists within lists’ and being able to create/check off anything in the minimum amount of taps. Bear in mind that it’s only for iOS, so if you’re looking for a desktop or Android app this simple, you might try Clear for desktop Mac or TickTick for every platform. Unlike some apps on this list, Todoist prides itself on being available on every platform. It has everything you’d demand from a checklist app, with the added bonus of being able to set up custom filters and saved searches. Todoist is also a collaborative app, so you can invite your family or coworkers to come in and work on tasks with you. This is awesome for a shopping list you share with your wife or a to-do list for a work project in your team. For a full rundown of Todoist and how it stacks up against Wunderlist and Any.Do, go here. 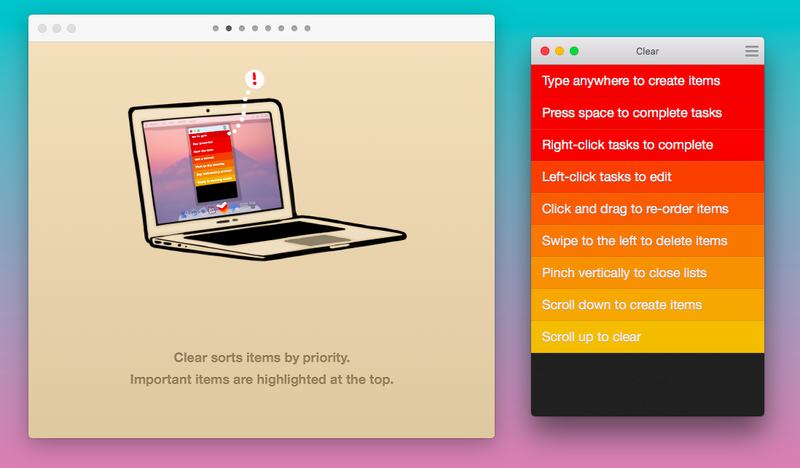 Things is a Mac-only app including projects and tags. It’s super simple, and optimized for quickly adding, tagging and organizing tasks with keyboard shortcuts. 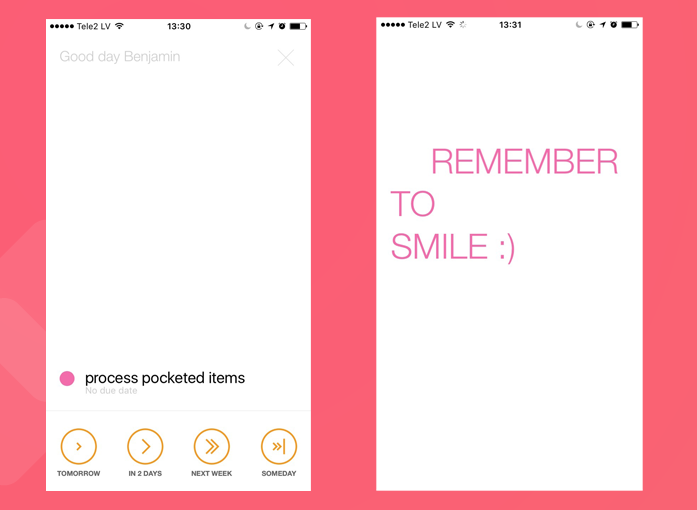 It’s the perfect to-do list app for power users. Using Cmd+N, Tab and Enter in sequence, I made this task below without clicking. Once I’ve made a task, I can drag it into a project, or time-based list. If I make the task in Inbox, the date will send it to a time-based list automatically. Right now, Things doesn’t have many proper integrations but you can dictate tasks into it with Siri and Apple Reminders. Overall, Things is an ideal GTD app with some bonus features like your Logbook. The Logbook tracks every completed task, so instead of hiding them like Wunderlist, you can get a quick look at your done list. A seemingly inconsequential (but important for me) feature of Lanes is the fact that you can change your background to any color or image you like. If I don’t like how my checklist app looks, I’m going to get annoyed with it pretty quickly. Lanes is a young app, but it’s being developed rapidly and was created purely by user suggestions. If you find that most to-do lists aren’t right for you, you might find Lanes to be your best bet. 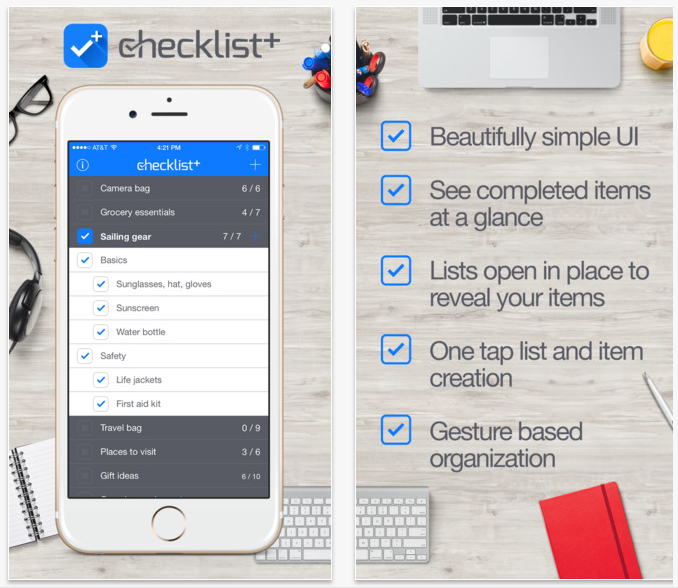 Which checklist app should you choose? I definitely missed some here, but here these are the apps I have experience with so I thought it’d be better to cover what I know. Got any other suggestions? What’s worked for you? Let me know in the comments. Time to get some work done, exactly like this cat. I just skimmed through 13 apps pretty quickly, but you should also check out the bonus material here: a full comparison of Any.Do, Wunderlist and Todoist. I go deep into the details of those apps, and compare which is the best to-do list overall. You definitely should add https://workflowy.com/ to this list. It’s extremely simple, but thanks to that you can use it for anything. Oops! I’m a huge WorkFlowy fan actually! Adding that in now. No WorkFlowy love?! 🙂 The best general list-making app, imo (ProcessStreet’s more specialized awesomeness notwithstanding). Wow, what a huge oversight. I’m a regular WorkFlowy user. Must’ve got complacent. Updating now! Hey Benjamin, thanks for the mention. I love Process St and we’ve started integrating with Zapier to control task assignment in Asana too. And I love the new forms automation feature. Keep up the great work and thanks for such a great product. Super post! Thanks for featuring Lanes – proud to share the list with such great apps. And true, we’re still only getting started feature-wise. Benjamin: I will check out Lanes. Have you tested TeuxDeux? Can you integrate with Toodledo? 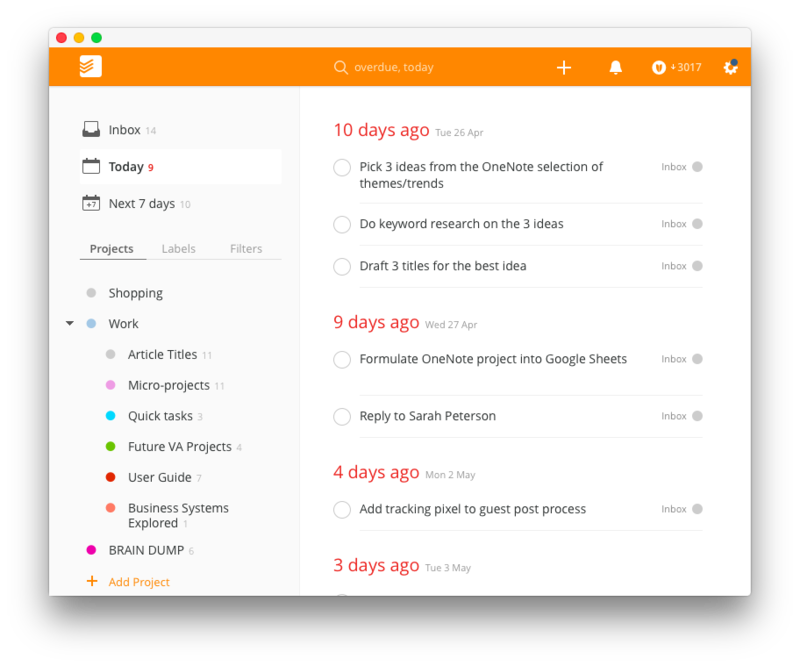 I found Toodledo to be excellent for managing recurring tasks and subtasks – we have several thousand deadlines running on it, and it does the job superbly. Planning trips, cooking meals, designing websites, even flying airplanes? No matter what you do, it’s utterly important HOW you do it, in order to succeed. Arktik is a checklist web app built so you can worry less and achieve more… by using failure as a tool for success! We’ve built a checklist tool which does exactly what a checklist tool should: power-up your efficiency! By reusing – previously defined – checklists, you can break the limits of your memory and attention. Arktik can be your guide and can lead you from the beginning of a project right until the successful reach of your objective. The best part? In the future, on a similar projects, you won’t need to rethink the entire process again! I’ve used Out of Milk for shopping and to do lists….tried to get into taking advantage of the many features of todoist but I keep procrastinating. So I’ve settled on giving commands to my Amazon Echo: “Alexa, put buy new tires on To Do list” or “Alexa, put kale on the Shopping List.” The lists are simple and uncategorized–but I did not have to stop and enter text, so that’s the tradeoff I’m using. For more complicated stuff, I keep a word document GTD style on my desktop. For routine stuff, I use the “reminder” function in Google calendar (workout, meditate, etc.) . So far, so good. Thanks for the insight into how you manage your tasks. Great to see that the Echo can be used so effectively. As for Todoist, it’s my current tool of choice because it recognizes due date by parsing the text. For example ‘buy new tires on wednesday’ typed into the main list will move that to Wednesday’s list straight away. I don’t really use any of the advanced features, actually, apart from keeping a ‘to read’ / ‘to watch’ list in another folder. One really annoying thing about any.do–if you’ve established notes or subtasks to a main task–two really inadequate things–(1) there’s no indication on the main task that it has subtasks, until you actually give focus to the task. (2) Worse of all–once you’ve completed the task, you CAN’T SEE the subtasks or notes, unless you uncomplete the item. That is idiotic. I’ve commented about this on their support site, apparently to deaf ears. In your evaluation, I’d like to see a point about search. In my opinion, search should be thorough–it should include both active and completed tasks, and it should includes notes and subtasks. Some of these apps do, but some don’t. Anyway, thanks for the analysis. Hi there… was really disappointed to see that Clear is only for apple gear. Also, the webpage in your link is a blank page (not your fault). RealMacSoftware does not even list it as available, so maybe something has happened to the application? It combines the some extra functionality with the simplicity of normal todo apps. Time Tracking, Projects and Categories together, and much more. Check it out! How can you write an article about checklist apps and not include the leader: http://www.Checklist.com ? I have 5 different checklist for specific processes at work that I need to use daily, sometimes multiple lists several times a day. Right now I just print a copy of the list I need and I check it as I go, once the project is complete I just purge the list. I want to go paperless since the printed checklist is useless to me. Can you recommend an app where I can set up and save all my list and then use, reset and reuse when needed? Thanks in advance! That’s exactly what Process Street does, and we allow 5 processes on our free plan. Once you sign up, you can click ‘New’, and then make a process with all of your checklist steps. When you’re done and want to run the checklist, hit ‘Run checklist’. There’s your re-usable, digital checklist. 🙂 You can also schedule them to recur automatically daily. I hope it works out for you. Let me know if you have any questions. For people looking for some sort of all-in-one app, I would suggest to try Tomatoid (https://www.tomatoid.com). Except checklists, it also implements time tracking or Pomodoro technique. And, if you are a freelancer (or maybe a student? ), you can also make use of the clients/projects management, history, reports or integrations with other platforms. I am in need of some help. I am looking for a checklist type program that is repetitive, can send automatic email reminders from a standard template to the invitees, is intuitive enough to know if I add a person to the list after the fact it will sent the email template. I would also need it to be able to schedule out reminders to the invitees with an email template. Any help would be greatly appreciated. I’m surprised no one has mentioned Meistertask, I love this app. I’ve experimented with all of the above [well-almost] and Meistertask has my vote. Even just the Free version of it is sufficient, i also use Trello and Checklist. I must say though that I do love how Process.St does, very intuitive and cleverly created. – Inside GMail, Google Calendar etc. Hey Panos! Totally agree. Plus, Google Keep makes it even better. Do you know if there is an app that allows you to see a list of all your projects at a glance, arrayed against a timeline extending out several months or a year? This is a bit of a specific request, but in your research did you come across an app that has double checkboxes? I reckon you know what I mean, but just to be sure. Say I have a checklist of “books”, I can have one box that relates to buying it, while the other box I can tick off when it has been read. Just thinking it would save time by making less lists. While also making it less cluttered. Google Keep lets you turn pre-written text into tasks that you can mark-off. I am looking to see if their are other apps that has this same function. I have a little trouble to fiddle in my use case though. I am looking for something for which I can easily setup hierarchical checklists, where I can fiddle in the same pattern at multiple places (and update the places by updating the pattern), can place multiple references and text to the check-list result, and export the contents to a decent report. Which of the above tools should I look into more? Or can you recommend another one? Could you explain in a little more detail what you mean? When you say “update the places by updating the pattern” that sounds a bit like our conditional logic feature whereby the rest of the checklist can change depending on what has been previously entered into the checklist. Could you give me a little more info?